River Witham Swords for sale are 38 ¼ inches in all. These swords are inspired by a real medieval artifact that was dredged from the River Witham near the town of Lincoln in 1788. That sword was estimated to be from either the Battle of Lincoln in 1141 or made in the late 13th century. This modern version features a functional and sharpened 31 ½ inch forged high carbon steel blade with a blood groove. Like the original, the blade is inscribed with: +NDXOXCHMDRCHDXORVI+. 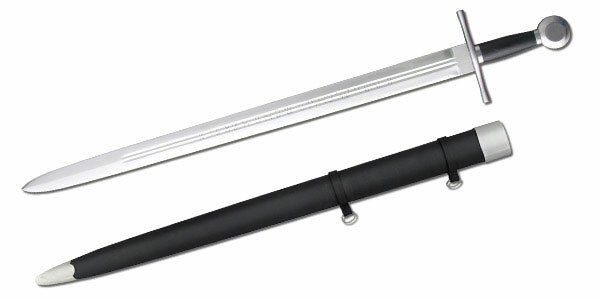 They have a 6 ¾ inches black leather wrapped grip with steel cross guard and a peened wheel pommel. They weigh 3lb 8oz and include a wooden black leather covered scabbard. Buy the River Witham Swords for $219.99.